JULES BASS leads a few of the Canadian voice actors in song! 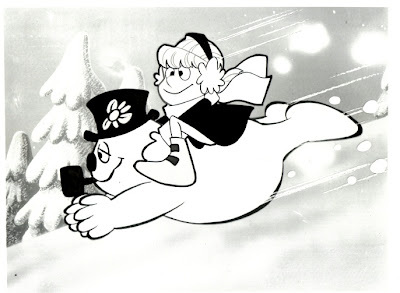 THE BALLAD OF SMOKEY THE BEAR starring the voice of JAMES CAGNEY aired THANKSGIVING DAY 1966! Everyone loves watching the classic ANIMAGIC special on DVD. It took quite a bit of persuasive action on Arthur Rankin's part to get CAGNEY for the special! 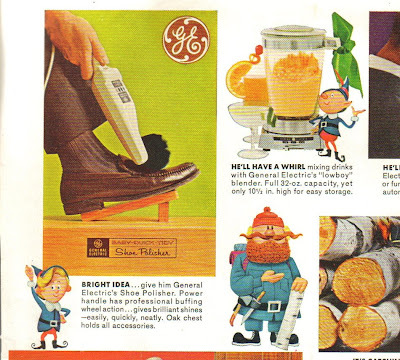 You can read about it in my book THE ENCHANTED WORLD OF RANKIN/BASS: A PORTFOLIO! It is almost BELLY WHOPPING time in CHICAGO! We are suppose to get snow flurries this weekend and be in the 30s! THANKS for the continued book reservations and DVD orders! Mailing many orders today! Another page from my ENCHANTED WORLD OF RANKIN/BASS Hardcover book! 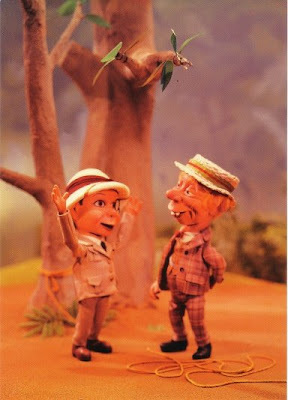 I love this RARE shot from the RANKIN/BASS lost pilot of THE EDGAR BERGEN & CHARLIE McCARTHY SHOW! 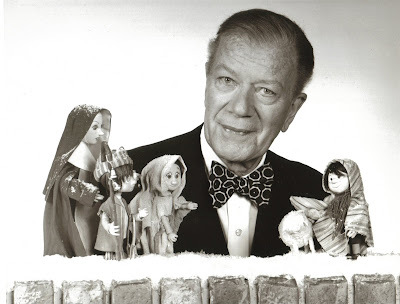 Arthur Rankin always laughs about how a famous ventriloquist became one of the biggest things on radio! My Mom tells me there are lots of clothes based on RANKIN/BASS characters at WALMART right now. Still have the DRUMMER BOY soundtrack on CD. Keep those book reservations coming! Labels: ARTHUR RANKIN, DANNY KAYE, JR. 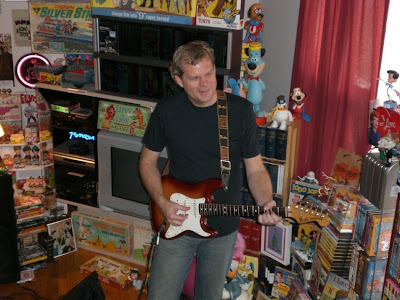 Check my pal PATRICK OWSLEY's blog for some cool, original cartoon art! Click at the LINK at the right of this page! I went into the printer's tonight and dropped some big time $ to get these books as quickly as possible. I can see that the demand is greater than what I originally had anticipated. I want to get cracking on these as early in the holiday season as possible. I think I got through to them and should be getting the books in drips and drabs so I can turn them around to you! Stay tuned! Heard from the printer today and they promised me books by 11-24. I thought I would have some more this weekend BUT no dice. E-mail Rickgoldsc@aol.com to reserve a book from this very small batch! I also have RUDOLPH books left BUT not many! Get yours soon! Steve Banes did this wonderful NEW cover for one of my favorite RANKIN/BASS films! Wanted to put something nice on our collector's DVD! 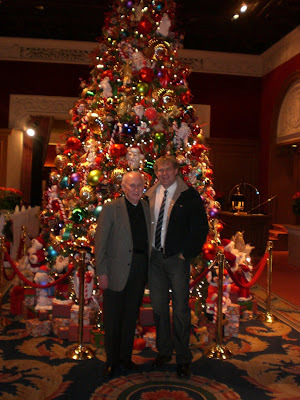 My pal legendary Musical composer for RANKIN/BASS MAURY LAWS! It was a BIG day for DVDs! 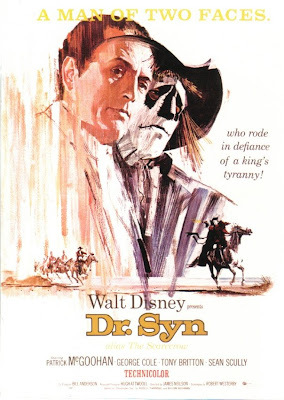 The long awaited DR. SYN, ALIAS THE SCARECROW came out starring Patrick McGoohan! My favorite SECRET AGENT MAN/DANGERMAN. The 4th DONALD DUCK set came out too with some of his BEST cartoons from the 1950's including DONALD IN MATHEMAGICLAND, TRICK OR TREAT and GRAND CANYONSCOPE. 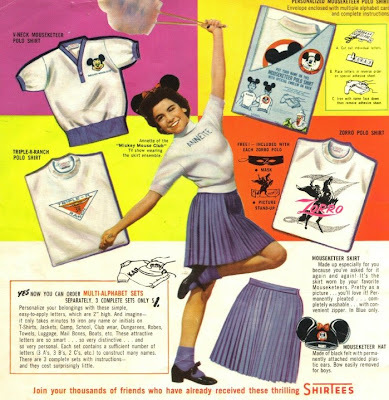 The ANNETTE Serial from THE MICKEY MOUSE CLUB was in the new batch of releases and features a complete MICKEY MOUSE CLUB episode featuring ANNETTE! 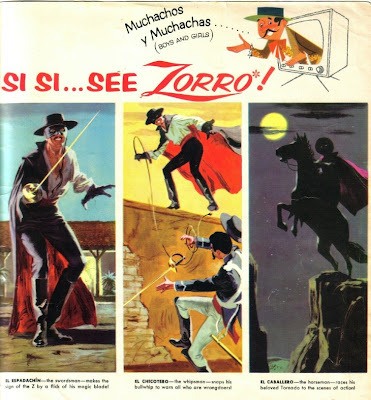 Hopefully ZORRO will not be too far behind! 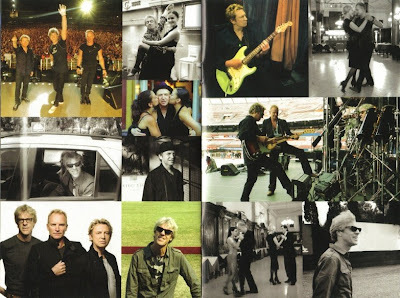 I HIGHLY RECOMMEND the NEW 2 DVD/2 CD set that came out today of THE POLICE for $20 at BEST BUY! 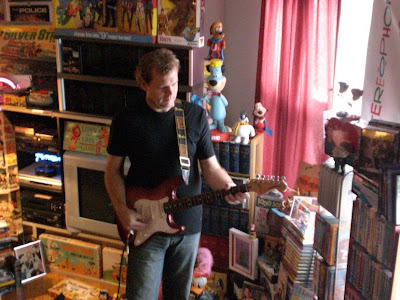 I have had a long history with THE POLICE and have followed them straight through their solo careers. This is by far, the BEST they have ever sounded. They took a step away from the band for 20 years and came back to it 4 times better as musicians. 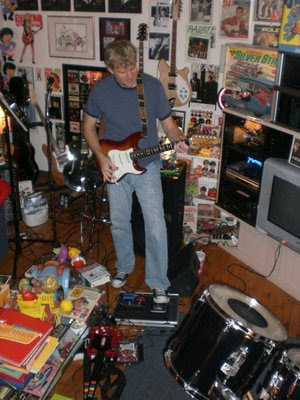 Andy's solos are complex and powerful and he use more power chords where appropriate. Sting is filling open spaces with amazing bass runs as he sings and Stewart is at his kinetic BEST! It is to their credit that they took the "Less is more" motto to this tour and just performed as a three piece. 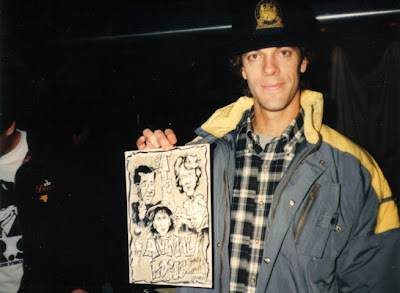 Stewart backstage at the PARK WEST in Chicago around 1991, during a show with his band ANIMAL LOGIC. 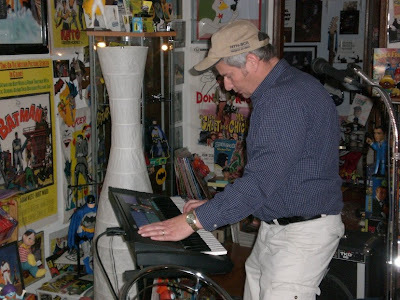 He is holding up a picture I drew of the band on Duo shade board, back when I was the Editorial cartoonist for THE REPORTER NEWSPAPERS. The band signed it as well. 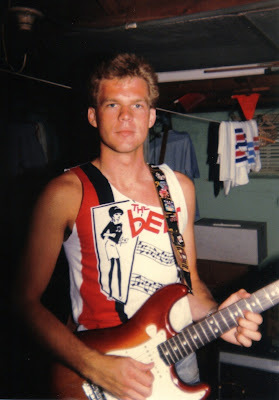 This is me circa 1985, when THE ARTISTS (Now STARVING ARTISTS) performed as "sort of" a POLICE TRIBUTE band to get gigs. 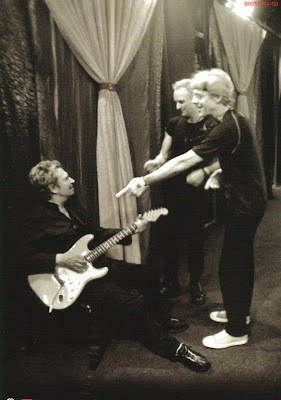 I played the STING/ANDY SUMMERS parts, since I was the guitarist and lead singer. 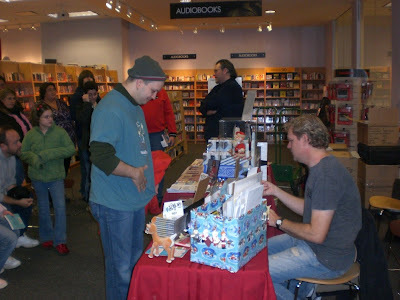 The book reservations are working out REALLY well! THANK YOU for responding! E-mail Rickgoldsc@aol.com I will most likely have books by the weekend and we can get an early and orderly start to the Holiday season! Like I said, the printing will be very LIMITED so it will be done on a first come, first serve basis. ENJOY! HAPPY HOLIDAYS! 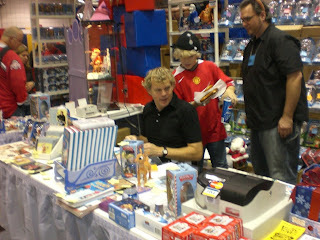 BOOK SIGNING of LIMITED EDITION of THE ENCHANTED WORLD OF RANKIN/BASS! By Popular Demand! I am now reserving signed copies of my LIMITED EDITION HARDCOVER 3rd PRINTING of my book THE ENCHANTED WORLD OF RANKIN/BASS: A PORTFOLIO for $75 + $6 shipping. I placed an order tonight with the printer and should have books by the weekend. I am not taking PRE-ORDERS BUT if you e-mail me at Rickgoldsc@aol.com and reserve a book, I will e-mail you when I have them for payment and then you will for sure get a book for the holidays of 2008! TERA is first on my list, she e-mailed today. Sorry I have to charge so much per book BUT it is very expensive to print these up at the quality I knew fans would want for this coffee table type book. Don't forget about our GIFT FOR GRANNY DVD offer! Check my postings in OCTOBER! Also, Be sure to pick up Bill's NEW book for the Holidays! Posting in September. 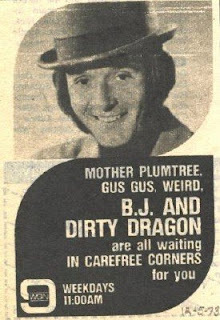 and the ads keep coming from RON MURPHY! I did a phone interview with Chuck Barney, the TV columnist/critic for the Oakland Tribune and Contra Costa Times in the Bay Area today. 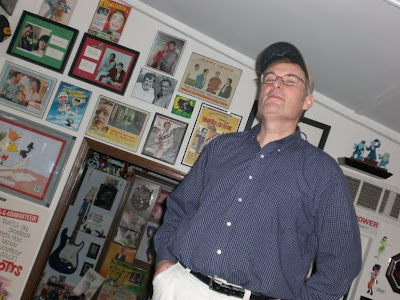 He is getting ready to do a fairly lengthy piece on classic Chistmas specials -- what made them last so long. Keep an eye out for the article. www.timeandspacetoys.com I got one of these over the weekend and they are VERY cool! 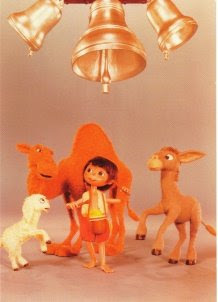 One of the better RUDOLPH products and there are a few different characters. 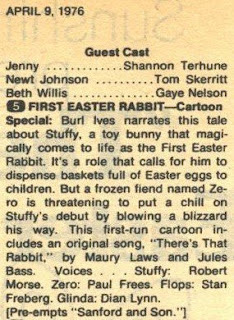 I should have THE FIRST CHRISTMAS on DVD this week! 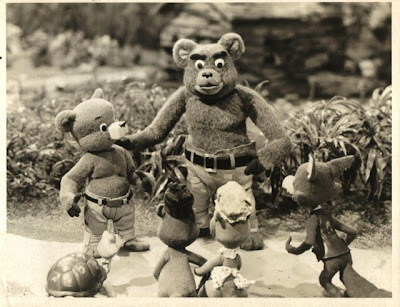 Here is a promotional picture of CYRIL RITCHARD and the cast (I owned two of these ANIMAGIC figures). ANGELA LANDSBURY voiced SISTER THERESA and it was originally called THE FIRST WHITE CHRISTMAS. 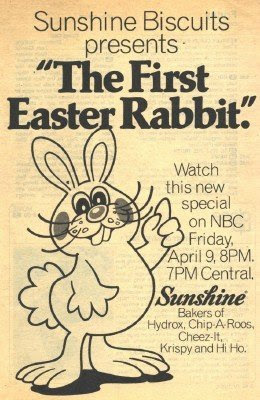 It is a popular title in the RANKIN/BASS catalog. I programmed lots of cool songs in the new ALESIS HIGH DEFINITION DRUM machine last night and they sounded really good this am. We even played a new JAZZ tune called "Tom Margarites." My sister Stacey couldn't make it for the video shoot...BUT she will shoot it soon. Dennis once again helped me with some more house projects and we added two really nice doors on the back of my home. 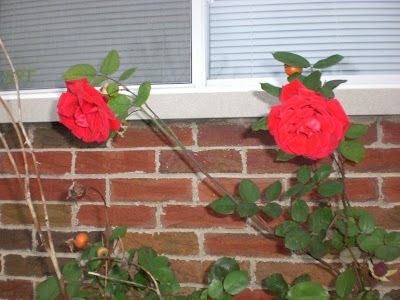 I had to take a picture of these ROSES that are still living at the front of my house in the frigid weather....winter has arrived. It isn't helping my ASTHMA much.